I had to explain that a facelift procedure is not like a car. We do not come out with a new model each year. I also explained that the facelift or neck lift technique that would work the best for her is the one that would give her the best result. I was not trying to be facetious but the fact is that most plastic surgeons have a tool chest of procedures and techniques, and the skilled cosmetic surgeons are able to choose which, of all the tools they have at their disposal, will provide the best results for each individual patient. So, what is the best facelift for the new year? There is no revolutionary technology or new technique that I am aware of on the horizon. 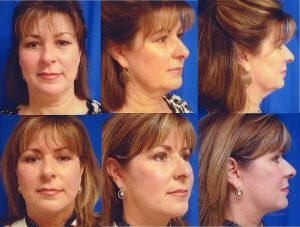 There are always new articles in the plastic surgery medical journals talking about ways to improve a facelift or neck lift technique but certainly nothing new. A move to less invasive facelifts and neck lifts with shorter facelift and neck lift scars. This results in faster recovery with not as much post-operative swelling and bruising. 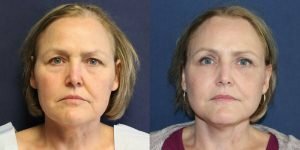 A shift away from the extensive facelift surgery techniques, like deep plane facelifts, and skin only facelifts to facelifts and neck lifts that support the tissue (muscles etc.) underlying the skin to give more longevity to the results without having to rely on the really involved facelift techniques to provide longevity. These facelifts or neck lift techniques are usually called a MACS lift which stands for Minimal Access, Cranial Suspension. 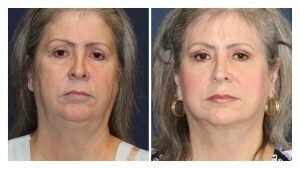 Consciously avoiding facelift techniques that produce unnatural or the “done” look. We are now trying to achieve a much more natural face lift or neck lift result than in the past. I tell my facial rejuvenation patients that we want their result to pass “the street test”. If you are walking down the street and someone sees you they think you look great and do not wonder who did your facelift. Fat clumping or nodularity, which can be especially visible through the thin skin of the infraorbital and cheek junction. Over time, the fat irregularity becomes encapsulated and can feel firm, mobile, and nodular. Extremely predictable results are the main advantage. Often less expensive than fat grafting. Less invasive as there is no additional surgical site. The answer to the question of what is the best facelift or neck lift for 2017 and 2018 is that it is really the facelift, mini facelift or neck lift that suits you! Many patients come in thinking that they would like to have a mini facelift, lower facelift or neck lift and after evaluation it is apparent that they need something a little different or possibly a cosmetic procedure in addition to a neck lift. I recently saw a woman who wanted a neck lift and indeed she would benefit from that surgery but she also had deep lines around her mouth, very prominent lower eyelid bags and extremely sun damaged skin. Ultimately, the plan we came up with for her included a neck lift but it also included filler around her mouth and lower eyelid area. These are areas that contribute to looking older but are not addressed by plastic surgeries like a facelift or neck lift. Her sun-damaged skin was also telegraphing her age so a skin treatment plan that included laser light treatment and micro-needling was created for her. Sometimes an upper eyelid lift will help as well. The goal of a facelift, a mini facelift or neck lift is to give you a natural result that does not look like you have had a facelift but that makes you look great and also natural. There are many before and after photos on the photo gallery of these plastic surgery procedures including patients after 40 and 50 years old. There is a cost estimator for a mini facelift, a full face lift, a neck lift and a nonsurgical facelift on the prices page. You just never know who is going to come into the office and what procedure they will need or want but I can tell you that the best facelift for 2018 and beyond is not what is new but what is right for you. I generally look for facial rejuvenation procedures that will fit your budget, have the shortest downtime possible, the least invasive and the least scarring but get the best plastic surgery results. If you are curious as to what would be best for you, give us a call or contact us here. Thanks for the thoughts you have provided here. Furthermore, I believe there are some factors that really keep your car insurance policy premium down. One is, to contemplate buying cars and trucks that are from the good set of car insurance firms. Cars that happen to be expensive are definitely more at risk of being snatched. Aside from that insurance coverage is also using the value of your car, so the higher in price it is, then higher this premium you pay.